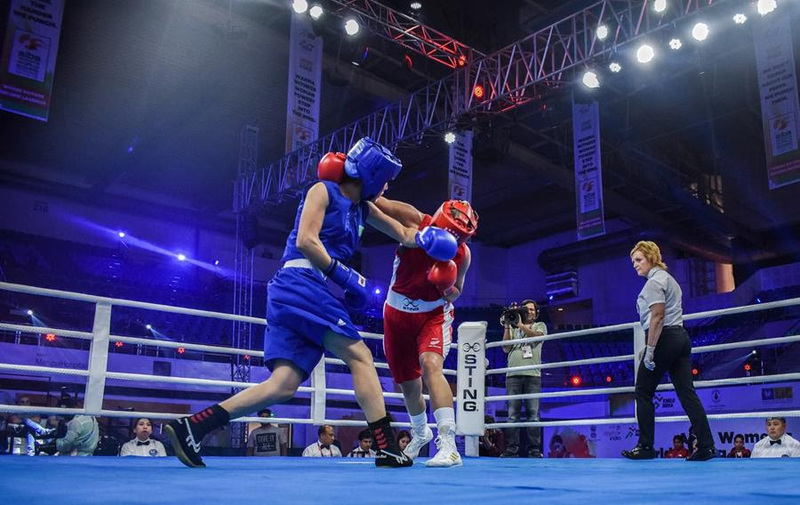 The flyweight (51kg) boxers were the first one on the ring at the 2018 AIBA Women’s World Championships in Delhi on Thursday afternoon, showing the path to the 52 athletes competing on day 1 at the expected tenth edition of the competition. The likes of Canada, Italy, Brazil and USA were among the countries progressing athletes into the next round after a superb day of boxing action in KD Jadhav Indoor Stadium. The first bout on Ring B was a glimpse of what could have been a final in the flyweight category (51kg), as Kazakhstan’s Zhaina Shekerbekova met EUBC European Women’s Champion Russia’s Svetlana Soluianova. The stylish performance of the Kazakh boxer confirmed her medal potential by defeating Russia’s favorite. Lightweight (60kg) veteran Sandra Brugger started her 6th participation at an AIBA World Championships with an impressive performance to defeat the talented Indonesia’s Huswatun Hasanah. Brugger hard preparation for the event has paid off today seeing the Swiss hope advancing to the next stage in New Delhi. History has been made today at New Delhi’s KD Jadhav Indoor Stadium with Scotland, Somalia, DR Congo and Bangladesh reaching for the first time the women’s boxing highest scenario, the AIBA World Championships. The participation of these four newcomers, coming from three different continents (Europe, Asia and Africa), prove the strong efforts made by AIBA in developing the noble art across the World.